Sandals Resorts are the pioneers of couples-focused vacations. With that being said, it should come as no surprise that Sandal properties provide the perfect setting for a destination wedding. We have worked with Sandals for nearly three decades to provide our clients with personalized weddings in some of the most beautiful destinations in the world. If you are interested in a destination wedding at a Sandals property, RSVP for our 2019 Destination Wedding Seminar on Tuesday, February 12, 2019. Our Sandals representative will be there to answer all of your questions and update us on all things new with Sandals Weddings. Read on for more. Book 3 nights or more and your wedding is free at any Sandals resort! All of the essentials are included (see above), so any investment you make can go towards customizing your big day. Read on for everything that is included in your free Sandals Wedding. Every Sandals Wedding includes a ceremony and reception, a personal wedding planning team, and complimentary preparation of marriage documents. Your get to choose the ceremony location, plus your bouquet and boutonniere are included, as well as cushioned Chiavari chairs for your guests. Your reception includes a two-tiered wedding cake, table setting with white linens, silverware and crystal, orchid centerpieces, and a cocktail reception with sparkling wine and hors d’oeuvres. In addition, even free weddings at Sandals include a manicure for the bride, 30-minute foot massage for the groom, music for your ceremony, and a signature cocktail that reflects your unique relationship and wedding theme. But the inclusions don’t stop when the wedding ends! You’ll also receive special honeymoon touches, like a romantic turn down service on your first honeymoon night, breakfast in bed, a romantic honeymoon dinner with white-glove service, and a complimentary 5″ x 7″ wedding photo. If you stay 6 nights or longer, you’ll receive up to $1500 in Premium Perks. This includes a $500 decor credit, $500 towards government fees or room upgrades, a $200 photography credit, $200 anniversary credit or videography, and $100 towards scuba, snuba, a beach cabana, or a candlelight dinner. You’ll also earn “Bells & Whistles” perks when you book 5 rooms or more for your guests. Even with just 5 rooms, you’ll earn one room category upgrade and a 2-minute wedding video trailer, among other options. 12 or more rooms will earn you a free Welcome Celebration Event, a $1000 credit toward a catamaran cruise for your group, and more. Check out their helpful tool for seeing all of the perks here. 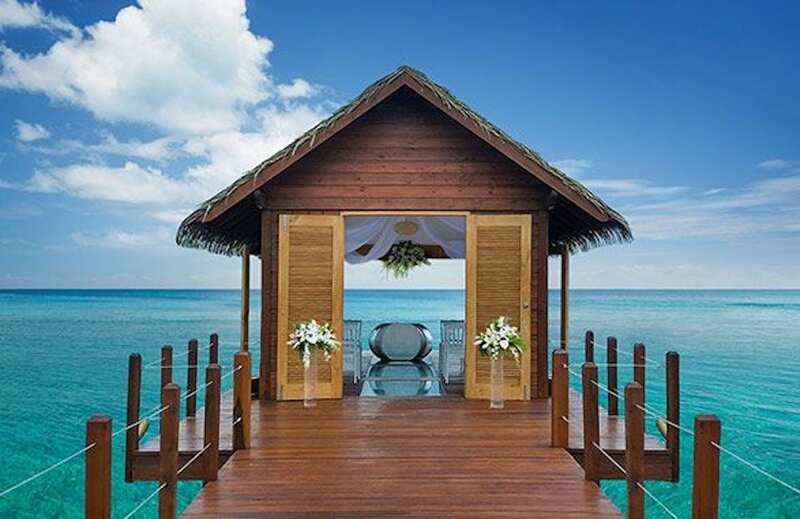 One of the most exciting new options for Sandals Weddings is the Over-the-Water Wedding Chapels. The above chapel is at Sandals South Coast in Whitehouse, Jamaica. They also have over-the-water chapels at Sandals Grande St. Lucian, Sandals Ochi, and Sandals Montego Bay. The stunning venue option has a 360-degree view and glass floor aisle. It is truly one of the most unique ceremony you can find. Sandals Montego Bay also has an intimate resort chapel option for your ceremony. The inside has traditional wooden pews and an elevated alter. 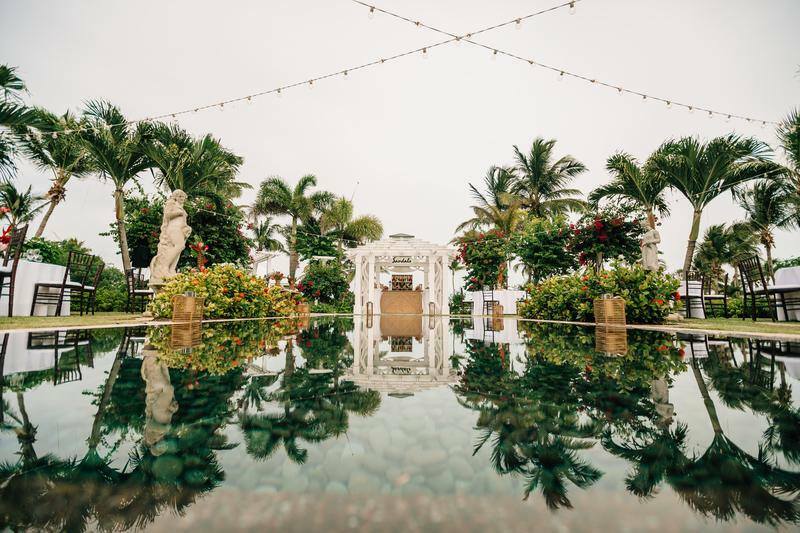 The outside path, lined with fountains and lush greenery, ensures your walk down the aisle is beautiful from start to finish. If you are looking for something a bit more low-key but not so traditional, opt for the oceanfront gazebo. This option is available at all Sandals properties except for Barbados. Each gazebo has a charming vaulted roof and gorgeous ocean views with tiled floors. This is great if you’ve dreamed of a beach wedding but don’t want sand everywhere. There are also garden gazebos at most Sandals resorts. Another unique ceremony option is the European Wedding Garden, pictured above at Sandals Emerald Bay in Great Exumas, Bahamas. This is also available at Sandals Grande Antigua and Sandals Ochi. Each garden provides an elegant backdrop with manicured gardens and calming pools. View all of the wedding venue options by resort and destination here. Call us today to speak to one of our destination wedding specialists. RSVP today for our 2019 Destination Wedding Seminar on Tuesday, February 12, 2019.